WeedEnder® Engineered Vegetation Control System has been used by Departments of Transportation across the country for many years now. 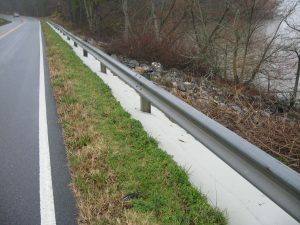 WeedEnder® eliminates unwanted vegetation from under and around roadside structures such as Guardrails, Cable Barriers, Gores, Highway Signage, Billboards, etc. Utilizing WeedEnder® not only dramatically reduces the use of herbicides but it reduces the exposure that maintenance personnel encounter along our nation’s busy Highways and Byways. Rest areas and roadside beautification sites are perfect areas to use WeedEnder® while helping reduce maintenance budgets. This site from Virginia DOT was chosen because of its location along the bank of the Swift Creek Reservoir which provides 20% of the water supply in Chesterfield County. Concerns from the public made this a great alternative to spraying herbicides. 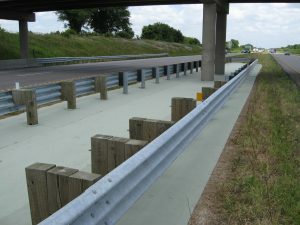 Missouri DOT evaluated ways to protect their roadside workers along interstate 70 by permanently eliminating vegetation at sites like this Underpass Bridge Gore location. Typically, they would have workers enter this area with string trimmers which is dangerous for the workers as well as the passing motorists. 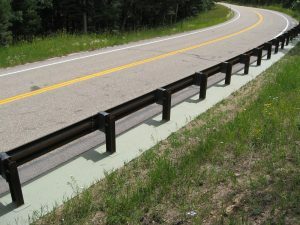 Colorado DOT uses WeedEnder on some of the states Scenic Byways so that motorists and tourists aren’t affected by roadside vegetation control operations along some of Colorado’s winding mountainous roads.